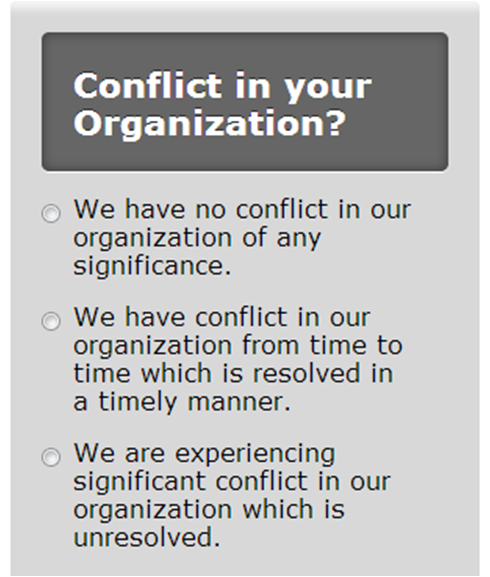 As a consultant in the governance of not-for-profit organizations and churches I am often invited to assist organizations because of some conflict within that is preventing progress and healthy functional relationships. In my experience there are almost always three elements to these conflicts, all three of which must be dealt with in order to bring the organization or church back to healthy function. One is an unclear structure. By that I mean that the design of how authority flows from the membership to the Board, to the CEO, to the management team and on to the staff is unclear. Who has how much authority and for what purpose is often assumed, not clarified, and to whom is each person or group accountable. The other is inappropriate use of power. The vacuum that is created by the lack of clarity is often filled by authoritarian people who take the opportunity to fill the void with personal power plays. Very seldom do we recognize that in our organizations, conflict begins with a poorly designed structure which is exacerbated by authoritarian power and the laissez-faire response. Whenever I encounter conflict within organizations and churches I suggest a four-step approach. First, negotiate a truce – a limited but defined period of time when people agree not to act out in conflict. Second, during that time work actively to define the structure so that everyone in the organizations understands clearly his/her source of authority and its limitations. This will almost always mean adjustments to Bylaws and the Governance Manual. Third, give everyone a chance to act in accordance with the newly defined structure. Fourth, where conflict continues to cause unhealthy relationship and poor performance, systematically call every party in the conflict to account to behave in a manner that is consistent with the structure. I have found that it is impossible to deal with organizational conflict in a structure where it isn’t clear how authority flows and to whom each person is accountable. You might be able to mediate a temporary degree of peace, but then you send people back into the same dysfunctional structure and wonder why the conflict doesn’t go away. Deal with the structure, not just the interpersonal conflict. 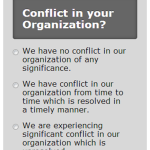 Please take a moment to be a part of the poll here to help everyone appreciate the degree to which organizations and churches are dealing with organizational conflict. Please also comment on this article or contact me if you want to discuss the conflict that you are experiencing in your organization or church.